I initially purchased Love Tea #7 because it was one of their teas that were made a part of their Valentine’s Day collection (but not exclusively so, like The Earl’s Valentine). It’s always been a tea that I was curious about because people in store always spoke highly of it and I’m nothing if not an equal opportunist when it comes to tea. The first thing I note when opening up the bag is the very strong smell of strawberries and chocolate. I mostly attribute that to the combination of the natural and artificial ingredients. 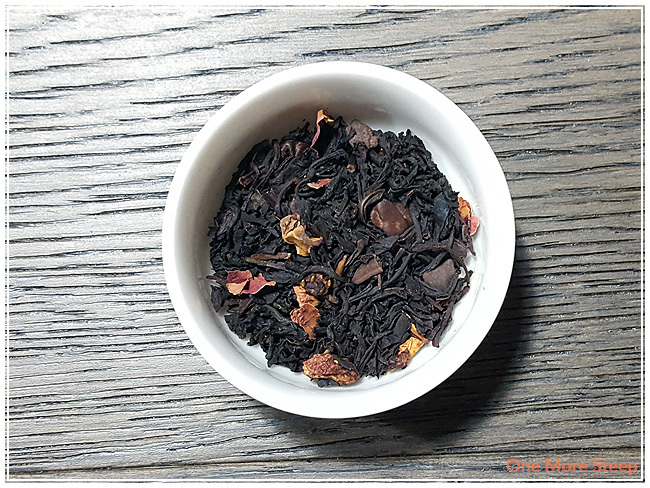 However, it is nice to be able to pick out the different ingredients in this black tea blend because I can see the black tea, the chocolate, the rose petals, and the strawberries. DavidsTea recommends steeping Love Tea #7 in 96°C (205°F) water for 4 to 7 minutes. If you look on the DavidsTea’s website, it’ll say “near-boiling” for the temperature but if you click on the words “near-boiling”, the temperatures will pop up on your screen with a range (90-95C°/194-203°F). The different temperature recommendations are a bit of a pain. Because it is a black tea, I opted to follow the Tea Association of Canada’s steeping recommendation of 100°C/212°F (more about steeping times here). Love Tea #7 steeps to a lovely reddish orange, I find that the first thing I can smell wafting up from the tea cup is the smell of strawberries and chocolate. If I concentrate a little bit more, I can make out the very faint smell of vanilla. It’s not a very strong smell of vanilla though, I think it would have been stronger if they had opted to use pure vanilla flavouring versus the artificial vanilla. When drinking Love Tea #7, the first thing I taste is the black tea base. There’s a mild nuttiness to it, and reminds me of a robust breakfast tea in terms of flavour. 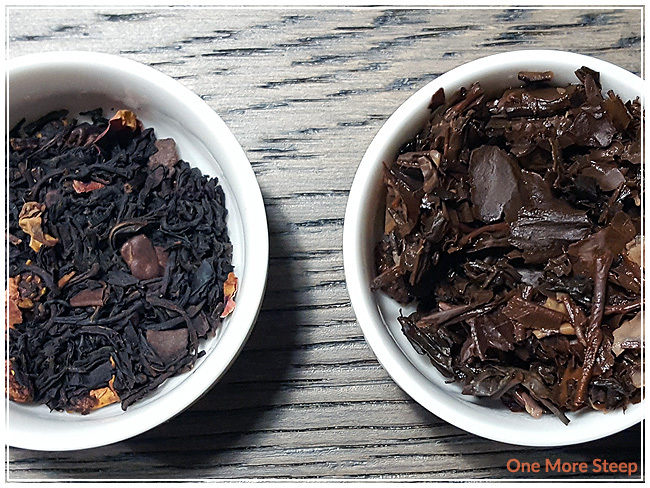 The strawberries and chocolate play second fiddle to the base, which is disappointing since the strawberries and chocolate were so in the forefront for the dry leaf and even when smelling the steeped tea. The chocolate chips do leave an oily film resting on the top of my tea, and I found that it does add to a bit an oily mouthfeel to the tea but it isn’t so thick that it’s off-putting. I think it helps that the chocolate pieces were fairly small in size. Adding a touch of honey helped to bring out the strawberries in the tea, but the chocolate was still quite minimal in terms of being present in the flavour profile. 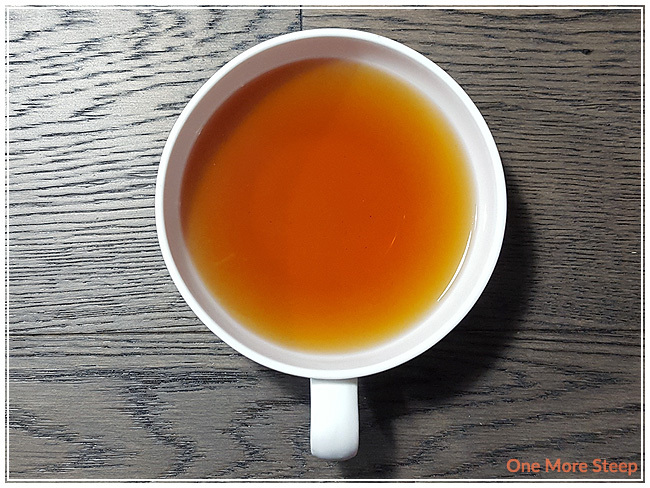 I attempted to resteep Love Tea #7 and found that the flavour was primarily the black tea base with very minimal contributions from the chocolate or strawberry. No vanilla was to be found. 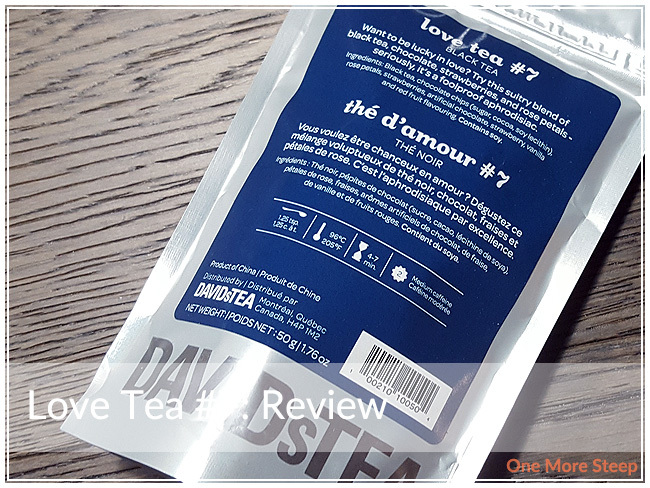 I didn’t like DavidsTea’s Love Tea #7. I really wanted to like this one, mostly because it smelled so good. Unfortunately, how it smelled in dry leaf compared to the actual taste of the tea did not match up at all. The tea did okay with the addition of a sweetener (honey), but the chocolate was still lost. This is definitely a tea that is not good for one more steep because it does so poorly with being resteeped in terms of flavour. The black tea base of Love Tea #7 is a good strong base though, but I would very much hesitate to recommend it due to the fact that a breakfast tea would be far less expensive than this black tea blend.